This New Year’s Eve, start a new family tradition and make a time capsule. Create a list that includes current events in your life, favorite things, your state of mind, goals and resolutions for the upcoming year. 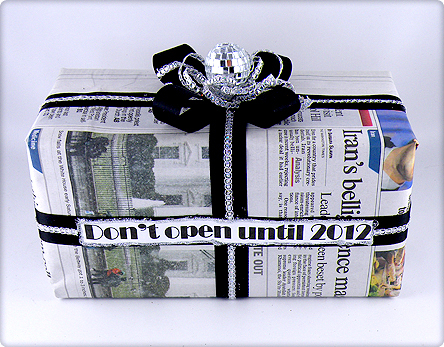 Gather photos and items of interest along with your list put it in a box wrapped in newspaper from New Year’s Eve. Label it “Don’t open until 2012”. It will be fun to open next New Year’s Eve to see everything you put in the box. You will be amazed at how much has changed in just one year and also how much has stayed the same. This is especially fun to do with the kids. I love to see how their interests have changed and how much they have grown. This entry was posted in Crafts, Everything, Gift Wrapping, Recycle, Uncategorized and tagged crafts with kids, disco ball, family tradition, Gina Tepper, new year's eve, new years, news paper wrap, time capsule. Bookmark the permalink.